Regular readers may have spotted that I have been watching quite a few films with Christopher Lee in them over the last few months. This was all kicked off by me going to see Dracula (1958) on the big screen in Manchester last autumn, and it's still Lee-as-Dracula that I am truly interested in. But there are only so many Dracula films with Lee in them available, and I have watched all of those since that fatal night, in several cases repeatedly. Once they ran out, I had no choice but to keep myself going with a) other tellings of the Dracula story and b) other films starring Christopher Lee - ideally ones in which he played a character as similar to his Dracula as possible. Click to embiggen, obvs, if you're mad enough. Recently, I've been using that list quite intensively to choose new films to watch, and of course to tick them off when I have seen them. 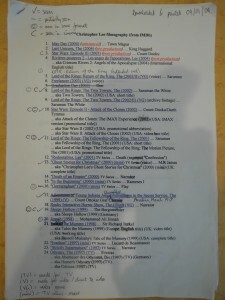 But after printing it out in 2004, I also began systematically blogging all of the films I watch on this journal in 2007. 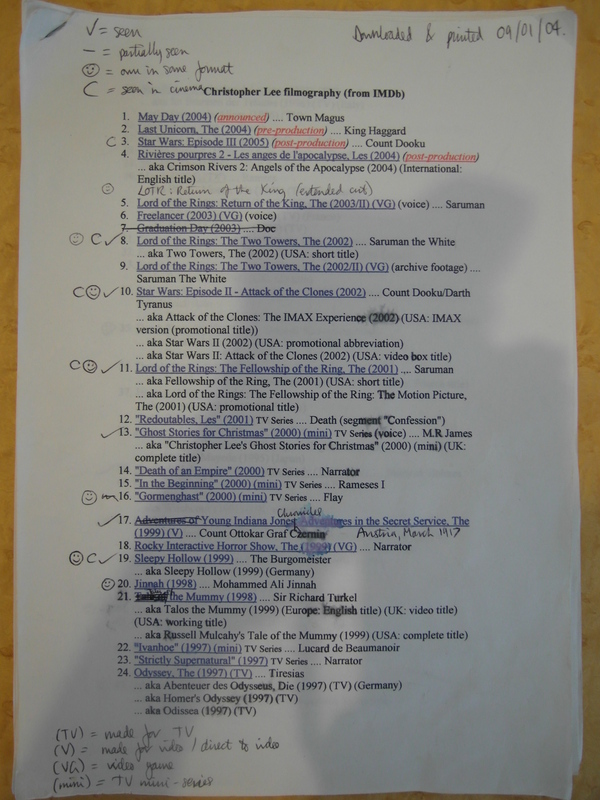 The obvious step forward, then, is to convert the list into digital form, meaning that it can easily be updated (unlike the printed copy) whenever Sir Lee makes a new film, and that I can link directly from the master list to every single one of my reviews (where they exist). Beautiful! So that is what this post is for. 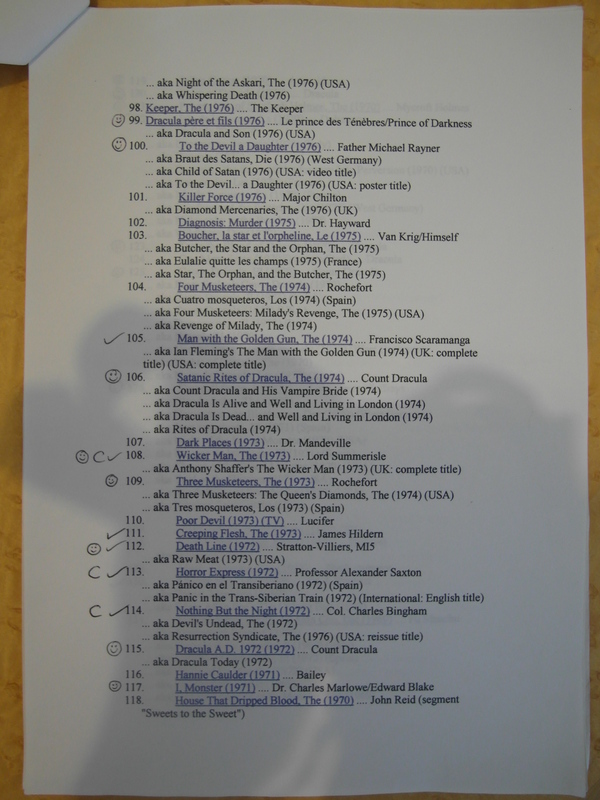 Fleetingly, people will see it on their friends pages, but really it is a permanent master-list for me, to keep track of my Christopher Lee film-watching and to add in the links when I write up new reviews of his films. Times have changed enough to mean that I no longer care very much whether or not I own any of his films, since most of them can now be rented within a few days from Lovefilm or the like, so I have discarded that category from my original IMDB print-out. I do, however, still care about whether I've seen them on the big screen, since that is quite a different experience from the small, so that is indicated by the word 'CINEMA' in all-caps after the entry. Simple bold text = seen, link = reviewed, a number after an entry relates to second or subsequent reviews, and I've also separated them into decades for ease of reference. 1973 The Wicker Man - Lord Summerisle, 2, 3, 4, 5, 6. CINEMA x 5 + INTERACTIVE SCREENING. 1966 Dracula: Prince of Darkness - Count Dracula; 2. 1957 The Curse of Frankenstein - The Creature; 2. CINEMA x 2. Now that I have updated and compiled the list, I am in a position to report that I have seen just over a quarter of Christopher Lee's screen appearances. If you walked up to Brad Pitt, Nicole Kidman or even Kevin 'six degrees of separation' Bacon and gushed about how you were such a huge fans of theirs, and had seen a quarter of their films, an awkward silence would probably ensue, because what you would be saying was that you had watched 17, 16 and 20 of their films respectively. They would probably conclude that you weren't really that big of a fan. But with Christopher Lee, the quarter-point comes at 70 films - more than Brad and Nicole (though not Kevin) have yet made. I have actually seen 75. That said, I'm pretty clear that it would be a really bad idea to attempt completion on this list. 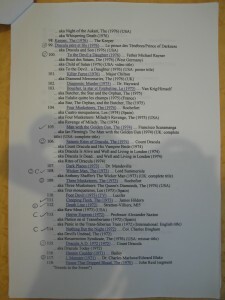 Lee has appeared in a lot of films I really love, particularly in the two decades between 1957 and 1976 (as you can see from the concentration of bolded text around that portion of the list), but he has also appeared in a lot of utter tripe, too much of which I have already found myself watching recently in my quest for something - anything - to scratch the Dracula itch. I also don't much like war-films or thrillers, both of which belong to a category of films which I disparagingly dub 'men with guns', and he didn't half make a lot of those in the 1940s and '50s. That said, there is one sub-category of his films which it is worth aiming for completion on, and that is the ones in which he co-starred with Peter Cushing. They are not all classic horror films, but the combination guarantees a much closer match to my personal preferences than Lee on his own does, and even when they aren't horror films, you are still getting to see an iconic screen pairing developing and maturing. With that in mind, I was careful to grab a complete list of their screen pairings with someone recently posted to a community I'm a member of on Facebook, and that follows below with the same basic mark-up as before of bold = seen, though without linking to the relevant reviews, because those are in the above list already. So I am actually within reach of completing that list, with only 7 6 5 3 out of 24 entries (some of them rather spurious) still to go. Now that one is worth shooting for!